Get more uses out of a DEWALT battery charger. Area light, dual port charger, additional outlets all in one charger! along with a slim design that is easy to fold-up, carry, and store. 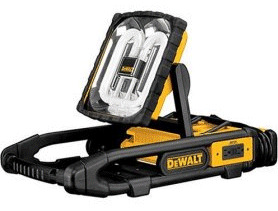 This charger provides an area light that can be powered by 120V AC Power or by DEWALT 12-18V Batteries (not included). The fluorescent bulb lights the area you are working in with the extreme heat of a halogen light. The spring loaded hold-down bars enable you to pack-up and carry the unit with the batteries in the charger without having to worry about the batteries falling out, helping you pack-up at the end of your shift. This charger also has two (w) 15 amp outlets which provide more versatility and outlets for jobsite power, so you don't have to waste time looking around for other outlets.